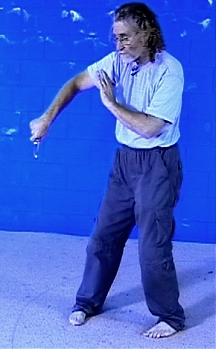 On this tape, Erle begins his Advanced Knife Fighting both using the knife against another knife attacker and using empty hands against a knife attacker or a group of them. Chang Yiu-chun was the supreme knife fighter even into his eighties. And it was not until Erle's final months of training that he opened up and told Erle how he got to where he was in this field. He used to perform a group of 12 short training methods using the knife. These training methods gave one the necessary tools and sub-conscious reaction that one needs to defend against a knife attack. These methods are shown on this series as well as the 'WAY' of Internal Knife Fighting as taught by Chang.